20-minute routine that firms and tones! Ready to get in shape but not sure you've got the time? Between long workdays, packed weekends and family obligations, it can seem impossible to fit in an hour of exercise several times a week. Fortunately, there are a variety of routines you can add to your schedule that will help you get (or stay!) in shape in just 20 minutes. Bonus: You can do them anywhere. We've asked Lesley Mettler-Auld, a running, triathlon and fitness coach, to share a 20-minute workout she does. The exercise routine she gave us can be used as a supplement to your current routine or as a primary workout if you're crunched for time. "It's designed to use all the major muscles of the body in a different way and is very efficient," she says. "Start with light weights until you get the motion down, then increase weight as your muscles are ready." Repeat each exercise for 50 seconds, taking 10 seconds to move on to the next exercise. Repeat the entire circuit twice. Begin in a plank position, with legs extended and feet hip-width apart. Rest your weight on your hands or forearms. Jump to a squat position. From there, reach your hands over your head and jump as high as you can. Return to a squat, step or jump back into plank pose and repeat. Holding a dumbbell in each hand, stand with your feet hip-width apart and weight on your heels. Lower into a squat while keeping your knees behind your toes. As you rise, curl the dumbbells into a biceps curl, then extend your arms and press the weights over your head with your palms facing inward. Lower and repeat. Begin in a plank position with your feet hip-width apart. Bend your right knee to touch your left elbow, then return to plank position and repeat with your right knee to left elbow. Continue alternating sides. Begin in a plank position on your feet or with your knees bent on the ground. Lower your body down into a push-up while keeping your elbows in and along your sides. Return to plank and repeat. Sit on the floor with your legs straight out in front of you. Raise legs to a 45-degree angle from your torso. Keeping your back straight, lean back slightly, forming a "V" shape with your body. Bring your arms out in a straight line, parallel to your legs, and hold this position. Lie on your back with your knees bent and abs pulled tight toward your spine. With your hands behind your head, extend one leg out while lifting your shoulders off the floor and bringing the opposite knee toward the opposite shoulder. Switch sides and repeat. Stand with your feet hip-width apart. 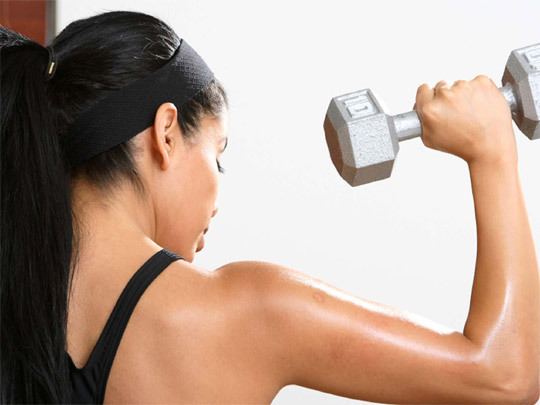 Hold a dumbbell in each hand and bend your elbows to hold the weights at shoulder height. Raise your right leg to 90 degrees and, with your leg raised, exhale and extend your arms up with palms facing inward. Lower your arms and leg at the same time and repeat on the other side. Bend at the waist, letting your arms hang down with a dumbbell in each hand. With a straight back and moving only your shoulders, lift the dumbbells up and out to the side until they're even with your back. Slowly lower and repeat. Keeping your arms at your sides and bent at the elbows, raise and lower your arms into a curl. Lying on the floor with a flat back and bent knees, place your hands behind your head and use your abs to lift and lower your head and shoulders.